Tim Holtz Idea-ology 1088 CHITCHAT STICKERS TH92998 at Simon Says STAMP! TH92998 /2.3 This item is on reserve until If you would like to reserve this item now, you may purchase it now with the rest of your order. We will hold your order now and ship your entire order as soon as this item is back into stock. If you would like your order to ship now, please place this item on a separate order. 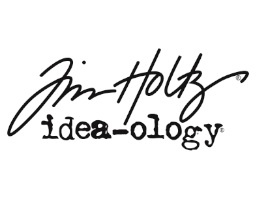 Success, Tim Holtz Idea-ology 1088 CHITCHAT STICKERS TH92998 has been shared! They are the ultimate crafting accessory - complete with 1088 individual stickers that are totally inkable! Yep, unlike every other coated glossy sticker out there, chitchat stickers are printed on matte cardstock and the same words are also printed on kraft cardstock ready to distress. These little guys can be used to say whatever you want, however you want to, in whatever color you want. This tablet of word stickers contains some of the most commonly used words. Each is 1/8 inch tall making them great for adding captions on scrapbook layouts. The spiral-bound tablet includes six sheets of stickers: two each of three word sets (one is white cardstock and one is black cardstock). Imported.